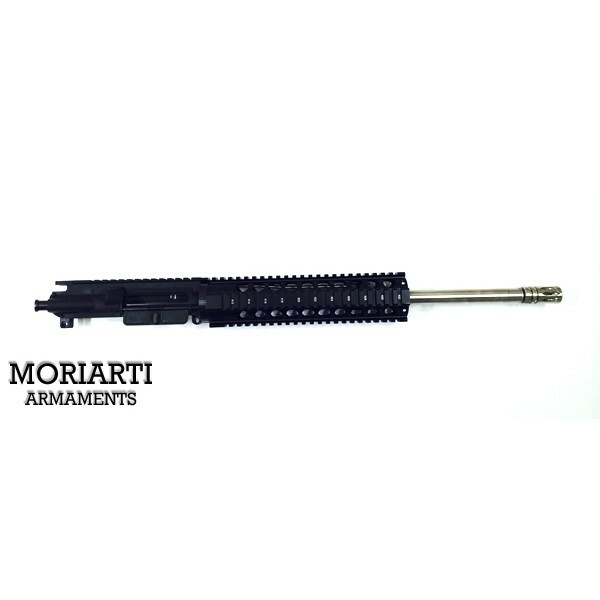 AR-15 5.56/.223 20" tactical upper assembly in stainless steel. 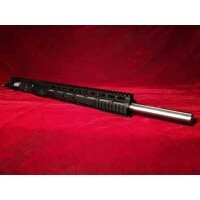 BARREL - 20" AR-15 416 STAINLESS STEEL HEAVY/HBAR BARREL CONTOUR. HARDENED TO 26-32 RC AND STRESS RELEIVED. CHAMBERED IN 5.56 NATO (ALSO ACCEPTS .223 ROUNDS). 1-8 RH TWIST 6 GROOVE BUTTON RIFLED. .750 UNDER GAS BLOCK. 1/2-28 MUZZLE THREADS, BARREL IS FINISHED OFF WITH OUR STAINLESS STEEL A2 COMPENSATOR AND CRUSH WASHER. M4 FEEDRAMPS. GAS SYSTEM - .750 MICRO GAS BLOCK MADE FROM AIRCRAFT QUALITY ALUMINUM AND BLACK HARDCOAT ANODIZED. RIFLE LENGTH GAS TUBE. 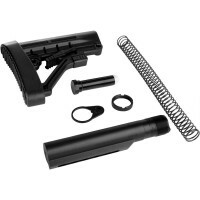 HANDGUARDS - FREE FLOATING RIFLE LENGTH QUAD RAIL HANDGUARD. MADE FROM AIRCRAFT QUALITY ALUMINUM AND BLACK HARDCOAT ANODIZED.